My Official (PRE) Release Day is Here! The day has finally arrived! 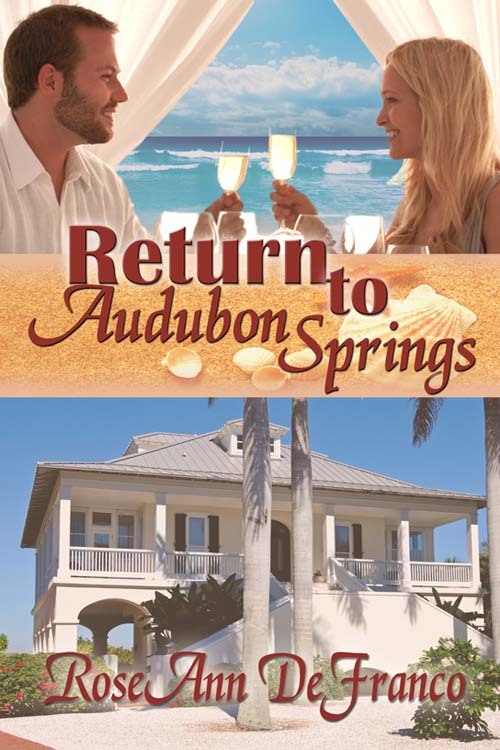 RETURN TO AUDUBON SPRINGS is officially available for world-wide consumption! My days of hiding in the romance writer’s closet have come to an end. So, let’s get this PRE-Release party underway! First…in case you have yet to see it, I give you my very first official book cover! Holy cow…yep, my name is on that baby! I love Rafe and Emma. They really and truly are one another’s soul mate having shared a special bond in friendship since childhood that bloomed into romance. I loved writing this story of rediscovering a love that refuses to die. And now Drum Roll Pah-Lease…. In honor of my very first (Pre) Release I’m going to give away a $5 Amazon gift card to a randomly selected commenter. To be sure to give this enough time to percolate, I’ll select the winner a week from now and will include comments from this post and any other posts I throw up during this first week’s excitement palooza. I’m excited. Can you tell? As always, thanks for stopping by and for your support. This entry was posted in Excerpts, Giveaway, Return to Audubon Springs, The Brothers of Audubon Springs and tagged BROTHERS OF AUDUBON SPRINGS, Excerpts, Giveaway, Release Day, Return to Audubon Springs, The Wild Rose Press. Bookmark the permalink. 55 Responses to My Official (PRE) Release Day is Here! THANK YOU! You are the BEST Beta Reader and largely responsible for motivating me to the finish line for this book. Thank you so much for your friendship on this journey, Chris! Jenna, Can’t wait to hear what you think since you will now have read the brothers out of order! Thank you for your friendship and support! Congratulations! wishing you huge success! Thank you for your kind words, Robena! I’m glad you’re enjoying the story. If it’s loud and hard to miss, then yes, it must be Rafe! RoseAnn, many, many congratulations! I just bought it for my Kindle and look forward to plunging into it as soon as I get my current WIP turned in to my editor. So excited for you! Woohooo! Thank you so much for your support, Nancy! I can’t wait to read your current WIP, not to mention your current release! Forget to say how much I love the sunshine-y, beachy feeling of your cover. Congratulations to you RoseAnn! I hope the sales are a smashing success…I know I’m buying it! Wow, that Rafe is sizzling. Love the excerpt. Thank you, Nicole! Rafe does like to make a statement. He’s a larger than life hero and I really enjoyed writing him. WooHoo!! Congratulations! I just downloaded your gem! Can’t wait to read it! Wishing you great success! Hello to the other Rose Ann! Thank you for stopping by and for your support. It means so much to me! Congratulations on release day, RoseAnn! I just bought my copy. Can’t wait to read it! Thank you, Emma! Love your name, btw…which is why I stole it for my Heronie! Congrats on release day. I hope everybody picks up a copy of RTAS. I didn’t need to excerpt to know it’d be good but it was much appreciated. Hi Mia! Glad to know you enjoyed the excerpt. I really enjoyed writing the food fight that preceeded this moment. These two really know ho to push one another’s buttons. THANK YOU so much for your support. I can’t tell you how much I appreciate it. Congratulations! Wishing many sales to you. Thank you for your well wishes and for stopping by, Lita. Congratulations, RoseAnn!! I knew you’d be published way back when I first met you. I love the cover too. Rachael! Thank you for stopping by. I’m not sure, but there is a CHANCE you may have read the original opening to this MS eons ago. Not sure. I do know that it was discussed during a plotting party at one point where the name Squatter’s Rights was tossed around. Thank you for your support. Much love, your Hubs and your littles. Awww…the lights of my life. THANK YOU! Could not have made it to this day without you. Congratulations, RoseAnn! That is a smokin’ hot excerpt. I can’t wait to read it!! Thank you, Nia! Rafe Sizzles. Emma has a tough time keeping her wits about her at times! Congrats, RoseAnn! Much luck with the release! What a wonderful time for you. Congrats on the book release! JUDY!!!! I can’t tell you what it means to me to “see” you here. Thank you so much for your support and friendship. Nancy, Thank you so much. Seeing you here means so much to me. Glad you noticed the dedication. Congrats! I can’t wait to read it!!! HELLO!!! I love to see the number of people coming out of the woodwork to celebrate with me. Thanks for stopping in, Jen! I hope you enjoy the book. So excited for you!!! Congratulations. You must eat cupcakes in celebration! If you’d like, I’ll eat one to celebrate with you. If you insist… ha ha!!! Excellent cover and I love the tension between the two main characters! I’m excited for you and wish you mega success! Thank you, Ashantay. Thank you for stopping by! Thanks, Maria. I wish you all the same! This is so exciting!!! I can’t wait to read it!!! And when you’re #1 on The NY Times Best Seller list I’ll get to say, “Oh! I knew her way back when!” So proud of you, Zann!!!!! Mary! Thank you for stopping by. I’m feeling the love! I’m thinking I need to create a character and name her Zann! Congratulations on your big day and many, many sales! Barbara thank you for stopping by and for your well wishes. I am so proud of my beautiful daughter for all of your hard work. Thank you for such a beautiful dedication. It brought tears to my eyes. I love Rafe and Emma and the continual sparring between the two. Mama! Thank you for stopping in and commenting. You remind me above all else that I am blessed with a wonderfully supportive family. I meant every word of the dedication. Congratulations Roseann. So Happy for you. Can’t wait to read it. Rafe sounds to die for! Don’t forget the little people when you are a big-time writer! Woo Hoo! Hi Annette! Rafe does make a statement. Emma is prety lucky. I hope you enjoy reading the story as much as I enjoyed writing it. Aww….Mama! You forgot to mention, there is a pretty impressive Italian mother in the story as well! Wonder where I got that from? I believe in book two she is referred to as “Award worthy” and not just for her gardens and food! T! Thank you so much for stopping by and for all the support! You have NO idea how much it means to me!